I was extremely pleased with the Juliette’s growth in Ignite Me. The Juliette who wallowed in self-pity; who was perpetually relying on everyone around her to orbit her like planets around a sun, and who only wanted to be protected, has finally matured. She’s ready to learn to harness her powers. She’s ready to fight for her future. She’s ready to become a leader and lead an army into battle. She’s ready to take on the supreme commander, the most powerful person alive. The whole time I was like “YESYESYES JULIETTE ABOUT TIME YOU LEFT THE LAND OF FAIRYTALES AND ENTERED THE LAND OF REALITY.” I wrote this ‘letter’ to Juliette in my ‘Unravel Me’ review, and after reading said letter, I’m delighted to announce that none of the points I addressed apply to her anymore. YAYYYYY! Unfortunately, I was incredibly disappointed with Adam. The Adam who I described as “caring, loving” and “the only person who stood by her (Juliette), protected her and treated her like a human being”, just…suddenly vaporised into thin air. The Adam in Ignite Me was malicious, overbearing and consistently bitter about Every. Goddamn. Thing. WHAT HAPPENED? What happened to the once compassionate and caring guy? Who’s this fraud who would throw around phrases like “I’d rather you were dead”? And since when were guys so emotional all the time? Even though I'm Team Warner and honestly at the start of the book I semi-wanted Adam to just disappear so Juliette could embrace her true feelings and ride off into the sunset with Warner, I still wanted the 'competition' to be fair. Adam's character was so inconsistent compared to what he was like in Shatter Me; I was like "Is this really the guy Juliette (and us fans) fell in love with, because he's a completely and absurdly different person here." The last few chapters of Ignite Me were packed with fast-paced action. My only problem was that too much time was spent preparing for the inevitable battle – almost 85% of the book lead up to the climax- while the actual fight was over too soon . The climax wasn’t bad or anything, but I felt the ending was too rushed. Yes, I’m a girl and yes, I do love drama, but some of those very melodramatic lovers’ quarrel scenes could’ve been cut out and replaced at the end with a more fleshed out ending. Apart from the rushed ending, Ignite Me was fantabulous<3 I already miss all of the wonderful characters Mafi first introduced to us all those years ago. If you haven’t read Ignite Me yet, GO GRAB YOURSELF A COPY!! THIS IS NOT TO BE MISSED. 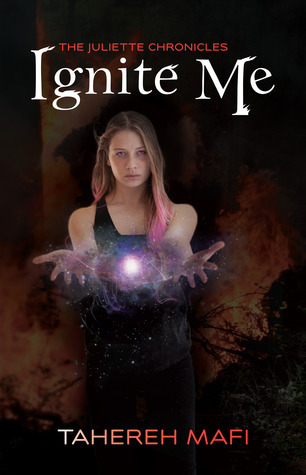 A massive thank you to Allen & Unwin for providing a copy of Ignite Me for review!